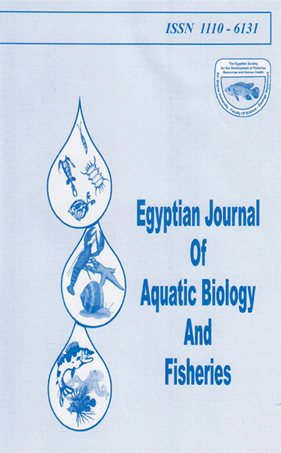 National Institute of Oceanography and Fisheries Fish Research Station - El-Qanater - El-Khayriya - Egypt. AGroup of the exotic crayfish, Procambarus clarkii (total length ranging from 4 to 6.1 cm) was held with the early stages of fry of common carp, Cyprinus carpio Linnaeus, 1758 ; silver carp, Hypophthalmichthys molitrix (Valenciennes, 1844) ; Nile tilapia, Ore'ochromis nihticus (Linnaeus, 1757) ; and Sartherodon galilaeus (Artedi,1757), with initial average lengtii ranging from 2 to 2.5 cm and fingerlings with initial average length rangmg from 4.1 to 5.8 cm . Each species were held separetely with the crayfish 5 aiming to find out its effect on both survival and growth rates of the above fin fish in polyculture.The results indicated that the survival rates ranged from 74.4 to 88.9% compared with a range of 76.6 to 94.65% in control experiments for the early fry stages of the four different fish species. For the fingerlings the range was 71.1 to 93.3% compared with 76.65 to 93.35 % in control experiments .There were no significant differences in the survival rate of the four fish species cultured in combination with the crayfish and the fish kept alone ( control).